Description: In the midst of a hostile military takeover and the destruction of his homeworld, Jor-El the lead scientist on Krypton sends his infant son to a far away and more primitive planet to grow up amongst it's inhabitants. The action, as is commonplace for director Zack Snyder, totally awesome. I have not seen other director do hand to hand combat quite as well as Snyder and he is back in full form with this one. We feel the impact of the punches and kicks, we also actually see them which is also to his credit: The shaky cam is not as bad as in most other modern action movies. Which is what this is, this is very much an action movie. Okay let me clarify, the beginning of the first act and the climax of this movie is almost non-stop action. We've got explosions and space ships and cars being thrown through the air. 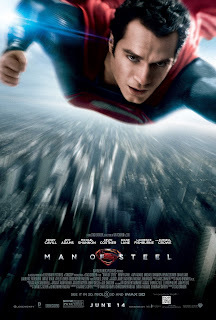 If you came into this movie expecting to see Superman use his superstrength you can rest easy: There is plenty of punching. It is also a spectacle movie to the point of it almost being a natural disaster movie in the same veins as 2012. The first time we see Superman himself is him saving people from a disaster. Henry Cavill is also a very good Superman, like with the former movies the crew of the movie seems to have made sure of casting someone relatively unknown: This builds his status as something of awe and wonder. It cements his status as an icon. Likewise, Amy Adams also does a very good job as reporter Lois Lane. Seasoned actors on the set like Kevin Costner also does a really good job even though they're put into the supporting cast member seats. Finally there's the designs. The Kryptonian costumes and Supermans costumes is actually very believable. This looks like clothes that could be actually worn. I'm also very much in favor of the special effects, the flying felt like looking at a jetplane. Which it should. It also bears mention that Snyder has toned down his tendency to slow-motion. This, however, is most likely due to creative consultant Christopher Nolan who also made the recent Batman trilogy. I'm glad to say that yes, Warner Bros. IS capable of making a good superhero movie not staring Batman. Okay, so as I said I do have some minor gripes with this movie. First off, the movie played a bit too heavily on the science fiction aspect of the Superman lore. Superman himself is played very foreign to our world, and the concepts of his adversaries is very typical of science fiction. There is a shot in the movie which is almost taken completely from the 90's movie Independence Day. While I did just compliment the designs of the costumes, I do feel that most of them were a bit too brown. The color scheme of the homeplanet Krypton is very much bronze and brown. This is not to say the designs were stupid, but it IS a very big contrast to say, the version of Krypton we saw in the Richard Donner movie. However, like that one, this version of Krypton is very much set in the tendencies of modern science-fiction. So I don't blame it. The musical score was also very forgettable, I couldn't hum it to you off the top of my head and I'm writing this right after getting back from the movie theatre. This is a shame, cause I know that Hans Zimmer was behind the score of the movie. Unfortunately, the sound effects just defeaned it out. Also, and this is a very nerdy gripe. The title of the movie. Calling this movie "Man of Steel" rather than "Superman" seems like a pretty obvious marketing trick. It is most likely meant to make audiences thing of "The Dark Knight", the most successful DC Comics movie to date. This movie however, is by no means as good as The Dark Knight. That's not to say it's bad though. The gripes out of the way, you should definitely make an effort to watch this movie. As far as superhero movies go, this is in the upper half of the spectrum. As far as movies in general go, you will definitely have a good time.